This. This was one of those recipes. You know, the kind that takes weeks and weeks of testing, where there's always something just a little off. Where the thought of giving up seems so enticing, but you've put so much effort into it already that defeat is not an option. Let's dive right in, shall we? First was the filling. How do you make a chocolate hazelnut filling? In my first two tries, the custard was cooked with finely ground hazelnuts then strained over and over and over again. It was impossible to strain out the super fine hazelnut meal through a mesh sieve, and the custard was far too thick to strain through a cheesecloth. Third time around, I thought up a brilliant idea of using hazelnut milk instead of whole milk. Unfortunately, nut milk does not have the same properties and chemical composition of real milk. The custard never set with the same amount of egg yolks and cornstarch. The fourth time I added an extra egg yolk and doubled the cornstarch, and while thicker, it still never set. I gathered it had something to do with either the absence of milk proteins or milk fat, but there is a surprising lack of information about the chemistry behind cooking on the internet (if you have a scientific explanation, please message me I'd love to know). Hesitant to add even more thickening agents to the mixture, I then made another version of hazelnut milk, using real milk instead of water, simmering it with ground hazelnuts, and letting the mixture steep before straining. So I guess you could call it a hazelnut milk milk. Ta-da! Success. Ahem, then there was the whole after-30-minutes-the-donuts-were-greasy problem. Fortunately the internet did have a solution for that: frying in vegetable shortening instead of oil. The short explanation is because vegetable shortening is solid at room temperature, the grease doesn't seep out after frying as it does with liquid oil. One more kink to work through, the dough wasn't quite as soft as I would have liked. The solution: more sugar, more egg, and we finally have a donut I'm proud to share. Cue the sigh of relief, here. Having made the chocolate hazelnut filling at least seven times and the complete donuts five (? I might have lost count) times in the past few weeks, I am officially burnt out. Hazelnuts and I, we're taking a short break. Donuts and I on the other hand, we're taking an extended break. Eating two whole long johns after making each batch in an attempt to get the perfect silky-oozy-filling-coming-out-of-the-center shot (which I never successfully got) will do that to you. By my estimate I ate at least 10 to 12 long johns in the month of February. So for now, we're done. We might get back together next year, but let's not hold our breaths. The wonderful silver lining to all that trial and error is I now have the best ever donut recipe to share with you all. 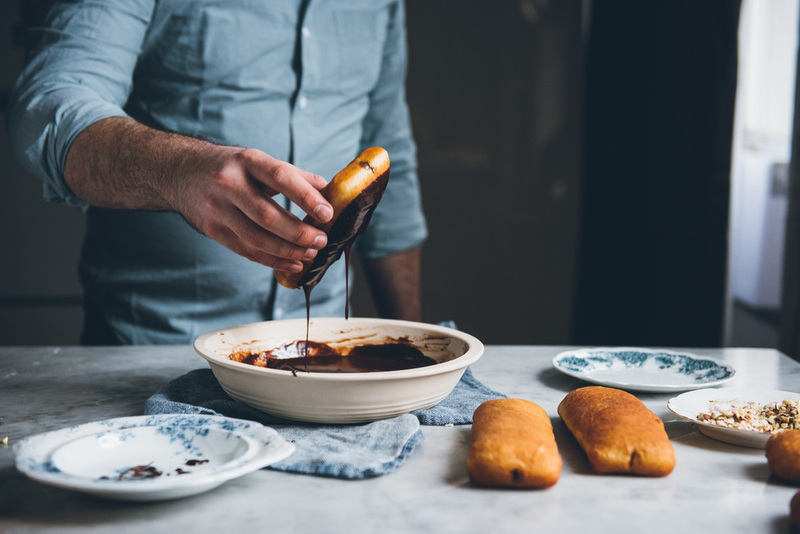 The dough is incredibly soft and yeasty, the filling is smooth and only slightly sweet with just the right amount of chocolate and hazelnut flavor, the glaze is intensely chocolaty, and the chopped hazelnut garnish provides the perfect textural contrast. I posted a donut recipe last summer, but let me tell you, those things are nothing compared to these, feed those to the dogs! (Kidding, please don't, it would probably give them a stomach ache). If long johns aren't your thing, I would highly suggest still using the dough recipe to make regular glazed donuts. And since most of you don't have complete, utter donut burnout like I do, hopefully you will get maximum enjoyment out of the finished product. It would make a great weekend project, just make sure you have guests to share them with as they're best eaten the day they're made. The pastry cream filling needs a good 3-ish hours in the fridge to chill completely before using, you can make it 1 to 2 days in advance so there's less work to do the day of. 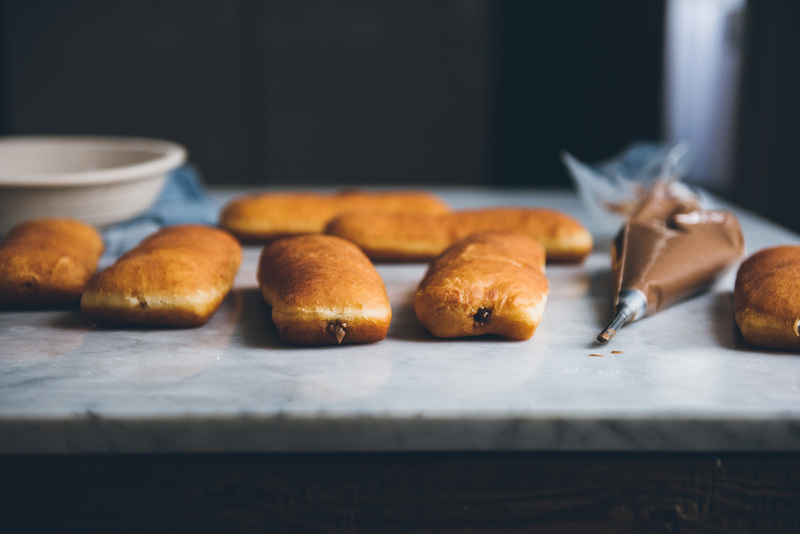 This recipe makes your standard size (read: quite large) long johns. I cut the dough into pieces that are about 7 inches by 2 inches. If you would like to make smaller ones (such as 6 inches by 1.5 inches), adjust your measurements accordingly. I highly recommend procuring a bismark piping tip, it will make filling the donuts much easier and less messy. Speaking from experience, a regular round piping tip is quite clumsy, and chances are you'll get odd pockets of filling close to the end and not much in the middle. Yields 8 to 10 large-ish long johns. In a food processor, grind hazelnuts to a fine meal. Transfer to a medium saucepan and add milk. Turn heat to medium and bring mixture to a simmer, stirring frequently so the bottom does not scorch. Turn off heat, cover, and let steep for 1 hour. Strain the mixture through a fine cheesecloth, wringing out the cloth the get as much milk as possible. You should end up with about 1 & 1/2 cups of hazelnut flavored milk, if you have less, add more whole milk until you reach that amount, if you have more, reserve the excess for future use (would be great for coffee!). Melt chocolate in a bowl placed over a small saucepan of simmering water. Set aside. Place sugar, egg yolks, cornstarch, and salt in a medium saucepan. Whisk until smooth. Add the 1 & 1/2 cups of hazelnut flavored milk, and whisk until incorporated. Turn the heat to medium and cook, whisking frequently. You'll notice it thicken right before it starts bubbling. Once it reaches a simmer, cook for another 1 to 2 minutes, remembering to keep whisking. Remove from heat and add the melted chocolate and butter to the custard, stir to combine then strain through a fine mesh sieve—note that I found the resulting custard to have a slightly grainy texture; to get it absolutely silky smooth, beat it with an immersion blender for about 30 seconds. Transfer to a medium bowl, cover with plastic wrap, pressing it onto the custard to prevent skin from forming, and refrigerate for 3 hours or until completely chilled. In bowl of stand mixer, sprinkle yeast over milk and lightly mix with a spoon. Let stand for 8 to 10 minutes until frothy. Add butter, sugar, salt, eggs, vanilla, and half of the flour. Mix with the paddle attachment for 1 to 2 minutes on medium low speed until smooth. Switch to the dough hook and add remaining flour. Mix for another 2 minutes. The dough should be barely clearing the sides of the bowl. If not, add more flour 1 tbsp at a time, scraping down the bowl after each addition. Do not add more than 1/4 cup of additional flour. Transfer dough to a well floured counter, it should be very soft and quite sticky at this point. Knead it by hand for 1 to 2 minutes until smooth. Transfer to an oiled bowl, cover and let rise at room temperature for 30 minutes. After which time, transfer dough to the fridge and let it rise for 1 more hour. 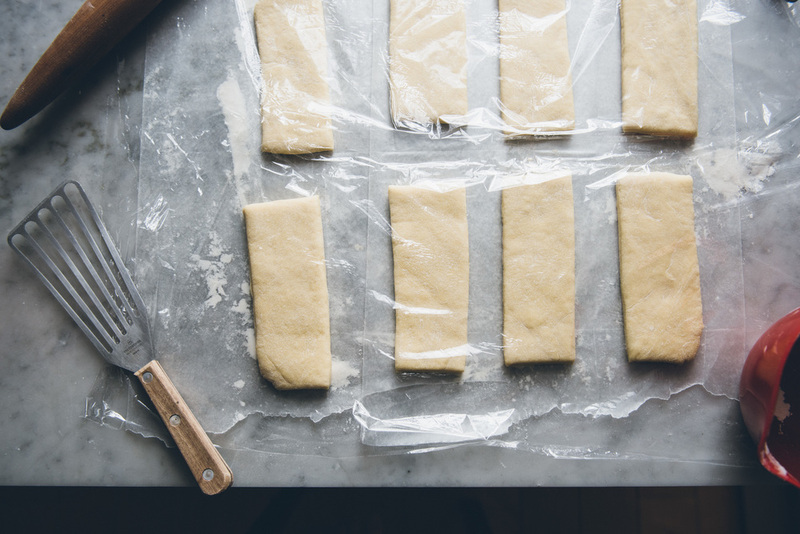 Remove dough from fridge and roll it into a rectangle that is roughly 14 inches by 8 inches after trimming the edges. Transfer to a large sheet of wax paper and cut dough into 8 equal pieces, each piece measuring 7 inches by 2 inches. For the excess dough, you can either re-roll it into an additional 1 to 2 pieces, or turn it into donut holes. Spread each piece of dough 1 inch apart, cover with plastic wrap and let rise for 35 to 40 minutes or until doubled in size. Heat up enough shortening in a cast iron pan for it to come up 1 inch when melted (I used about 2 lbs). Set up a wire rack lined with a layer of paper towels to absorb any excess grease. When the shortening registers 350 degrees F, fry each piece of dough for 1 minute per side. A fish spatula really helps here when transferring the dough to the shortening. Place each fried donut on the wire rack to drain and cool. Transfer filling to a piping bag fitted with a bismark tip. Using a long skewer, dig a tunnel through each piece of fried dough. Pipe filling into dough through both ends, you'll use about 3 to 4 tbsp of filling per donut. Make the glaze by combining chocolate, powdered sugar, and salt in a pie pan. In a small saucepan, heat up milk and butter until almost boiling. Pour over chocolate/sugar mixture and let stand for 5 minutes. Whisk the glaze until smooth. If there are any un-melted pieces of chocolate, heat the glaze in the microwave in 5 second bursts, whisking well each time, until completely melted and smooth. Dip the tops of each donut in the glaze and immediately top with chopped hazelnuts. The glaze with take about 10 minutes to set. If you have the patience, you can wait, but if not, enjoy immediately! *I don't recommend storing these donuts, they will deteriorate in both texture and flavor, even overnight.